A Rosette pond fish, also referred to as golden rudd, is family of the cypriniformes. In large ponds this fish may grow to be as large as 8 to 14 in. 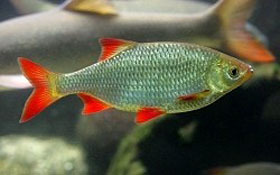 You can recognize a Rosette by its red fins and back as well as by silver to pink belly and sides. A Golden rudd is a strong fish by nature, which will not fall ill easily. However, it is sensitive to carp louse and mould. Your pond should be at least 28 in deep to enable a rosette to hibernate and locally it should have a shallow depth of 8 in for propagating purposes. A powerful filter is necessary, because a golden rudd likes clean water with a slight flow. Also the oxygen content of the water is very important. So, an air pump is to be recommended. Put Rosettes in a school of at least 10 to 15 specimens. Special balanced and easily digestible feed has been developed for rosettes.